Setup Area: driveway, parking lot, street parking, flat surface. 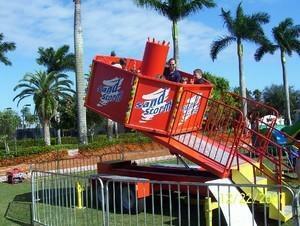 The Sand Storm amusement ride is a large mechanical ride. It is made for 11 adults or 14 children. Sit inside the tub and get spun silly while the ride tilts back and forth on a slope. MINIMUM 3 HOURS RENTAL ONLY.